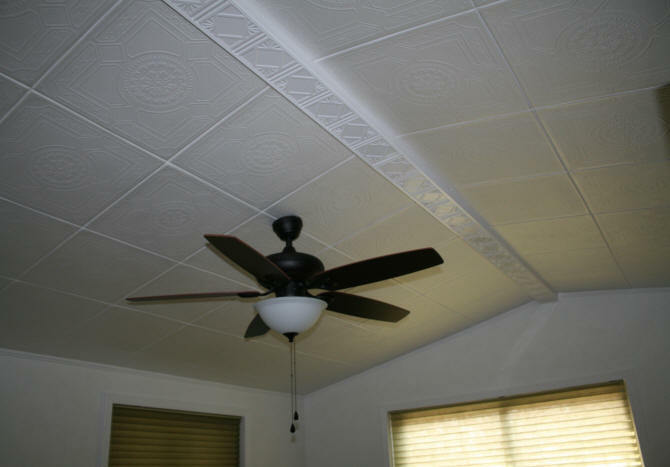 Styrofoam ceiling tiles have become more popular in the past five years. 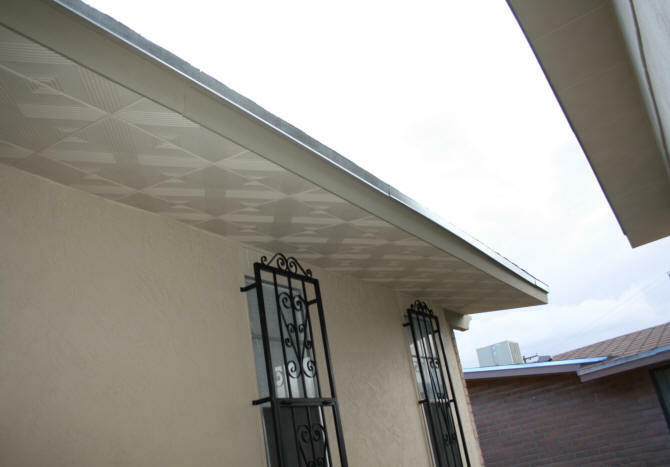 With metallic paint, the tiles can mimic the look of the old fashion tin tile ceilings. 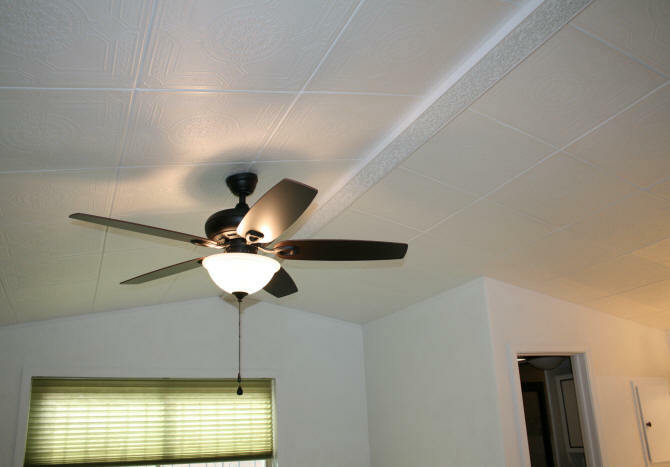 It is also a quick and decorative solution to covering up hideous pop-corn ceilings. 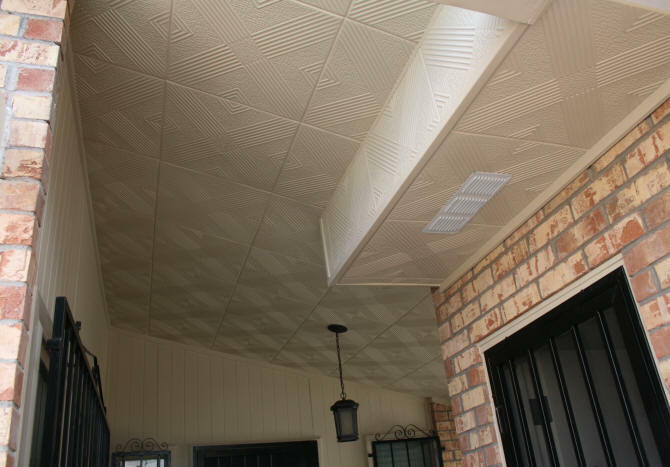 I first came across the styrofoam ceiling tiles when I was looking for something to cover-up the popcorn ceiling over my front entrance (foyer) in 2013. This ceiling section is only 82 inches high. 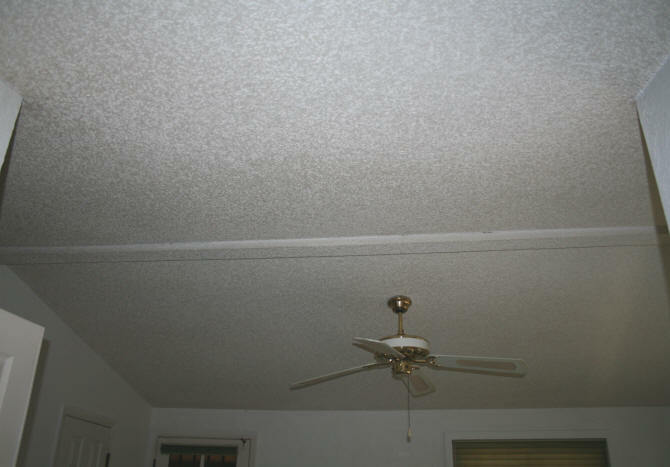 We were always brushing something against the ceiling knocking off the texture. When I say styrofoam, think of the more modern styrofoam egg cartons. These tiles are made of the same stuff. It is lightweight and can be easily gouged or dented. On an average height ceiling or higher, this should be a non-issue. 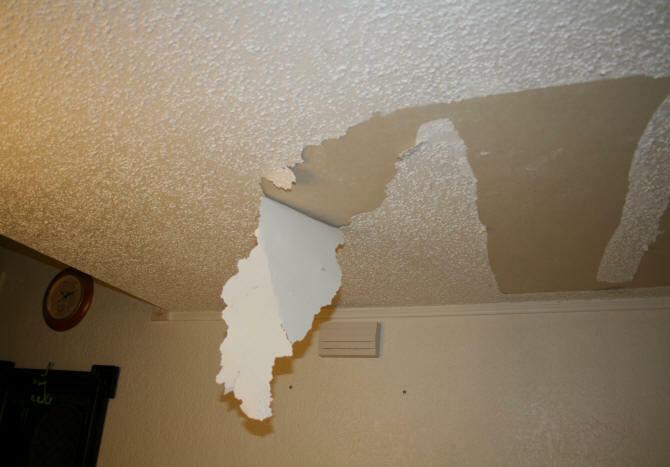 If your family is constantly scrapping the ceiling with long objects, this may not be a good option for you. 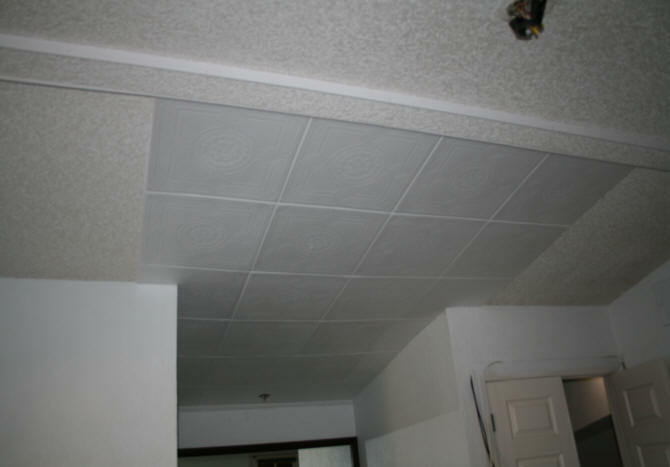 This page will highlight my experiences purchasing and installing the ceiling tiles on both inside and outside surfaces. I do not recommend one website over the other. They both shipped the items promptly and the items were received within one week, undamaged. Some websites give the dimensions 20" x 20". Some say 19.5" x 19.5". They are neither. The tiles are manufactured somewhere in Europe or Asia, so they use the metric system. They are 50 x 50 centimeters. The tiles are closer to 19 5/8" x 19 5/8". or 19.625". When determining how many tiles you need, and you are using inches, use 19.625 in your calculations. This will get you closer to exactly how many you need. 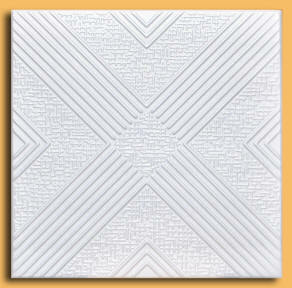 Whether you purchase painted or unpainted tiles, this your personal design choice. 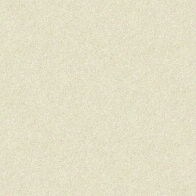 I purchased un-painted or white. I wanted to make my tiles a specific color to match the paint in my home. 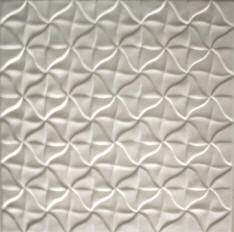 - Use water-based paint only - If you plan to paint your own tiles you can only use water-based paint. (latex, acrylic). Oil based paint or spray paint may damage the styrofoam by dissolving it. - Spray painting is faster - If you have a spray painting machine and a large open area to spray, this will be the faster method. In my case, I brush painted the tiles two coats of paint. 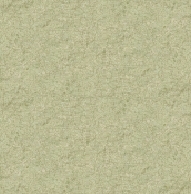 If you are painting a real dark color, you may need three coats of paint to go over the slick white surface. - Paint the tiles before you install them. It is a whole lot easier to paint something at ground level than to paint upside down on a ceiling. In my foyer, I installed the tiles before painting. I regretted this afterwards. All of websites recommend using just regular old mastic. 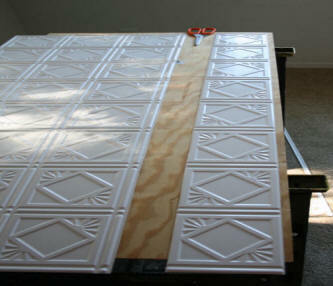 The same stuff you use for installing tile on a floor or shower stall wall. There is a difference between the brands of mastic. The difference being the firmness of the mastic. Placing the ceiling tiles on the ceiling and pushing up to smash the mastic flat between the tiles and ceilings is hard physical work. Your neck, arms, and shoulders will tire easily if you are not used to doing this work. If the mastic is real firm, the harder time you will have to push up, to smoosh the mastic flat. The tile websites recommend AcrylPro which is thick. I used the generic mastic I bought from a big box hardware store. This mastic is less firm than AcrylPro. So far, the tiles have stayed put just fine. In fact, where I had to remove tiles a few weeks later because I had damaged them with my scaffolding, it was very hard to remove. I had to break off the tiles in little pieces to get it all off. I bought some AcrylPro when I was at a smaller hardware store and tried it out. After 10 tiles, I was exhausted from pushing up harder than I was used to. You can tell that AcrylPro is the better mastic, BUT you will have to put more physical effort into installing the tiles. I am saving my partially used AcrylPro mastic for some floor tiles. - Some of the tiles still had the perforated edges. If not smooth, you can sand them off if you want to. - The depth of the design varied with every order of 100 that I placed. 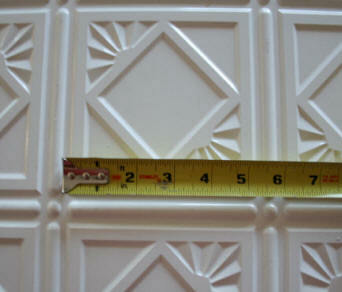 Meaning, it was higher on the first tiles I ordered and got flatter. Like the die was not pressing as hard. Or the styrofoam was a little thinner. 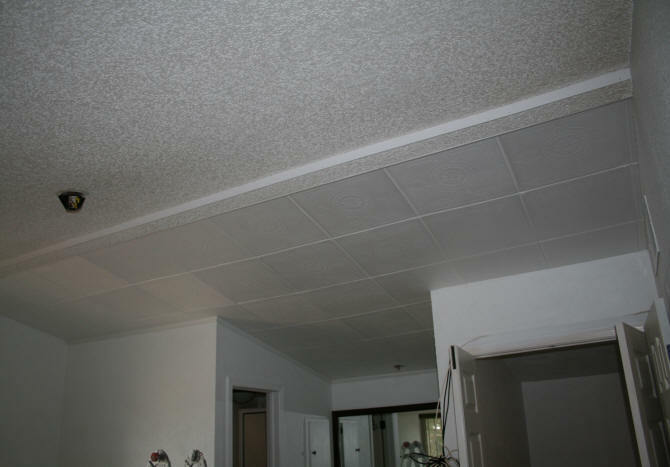 If you are installing the styrofoam tiles over a popcorn ceiling, you do not need to remove the popcorn all the way. Just rub over the pop-corn with a firm brush to remove any loose pieces. When doing this, you will make a big mess. Cover your hair, put drop cloths down, etc. If you have a lot of humidity in your home, like I did from a swamp cooler, you may have an even bigger mess. See below. The entire textured section came off without much work. Because this whole area, including the paint, was loose, off it came. 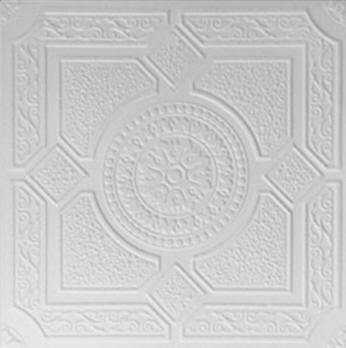 For this ceiling I ordered the ceiling tile shown below by Ceiling Tiles By Us. I wanted a small scale simple design because the area was so small. Total cost for this section was $66 for the tiles. 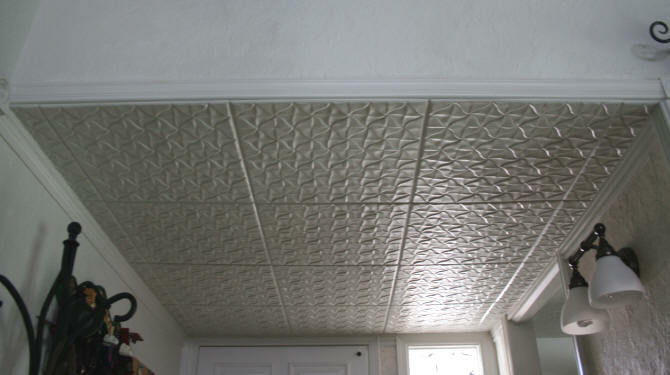 First, you find the center of your ceiling and place the first tile there. This is the most crucial tile. It needs to be straight and centered exactly. All of your other tiles will be placed against it as you work towards the edges. Once you get to the edges against the wall, you will most likely need to cut your tiles. Use a sharp blade and a good straight edge. Once the blade gets dull, change it. 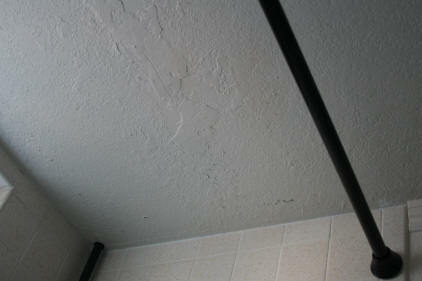 Once all of the tiles have been placed on your ceiling, you caulk all of the seams. Smooth out the caulk with your finger. I found you get a cleaner caulk line if you do a whole section going horizontally over a whole row. Wait an hour or so until the caulk dries. Then do the the rows vertically. Once the caulk dries, you can paint your seams. If you decided to paint your tiles on the ceiling then you paint everything. If you painted your tiles before installing, then you just paint your seams with the same paint. 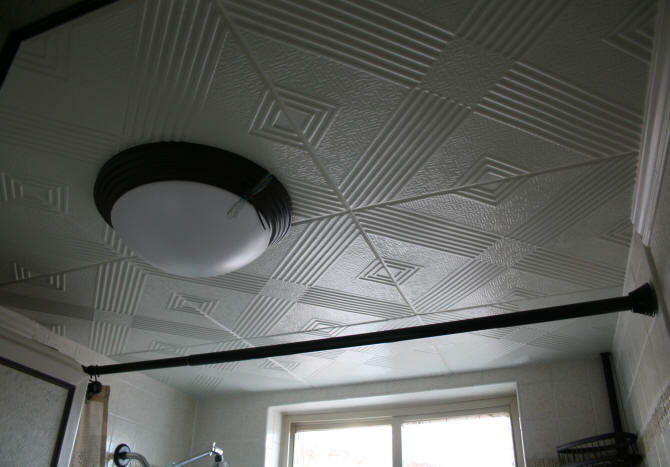 If your ceiling tiles are being installed in a room that is being totally renovated and you are installing moulding on your walls next to the ceiling, like crown moulding, you will get a cleaner line if you install the tiles first, then put on your moulding. You can actually do it either way. Entrance way two years later, November 2015 As of 2018, the tiles in the entrance way have held up fine. Nothing is pealing off, no cracks in the caulk. No humidity problems. Because this ceiling is so low, there have been a few hits to the ceiling, but no damage or noticeable dents. Before placing the styrofoam tiles on outdoor areas, I researched all over the web for someone else who had placed these tiles in an outdoor area. There were a few who had installed tiles on an enclosed porch area. That was it. 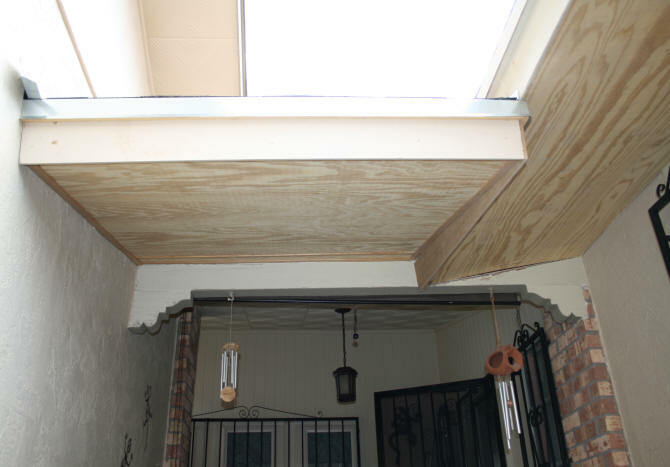 The reason why I wanted to do this was the ugly patio ceilings and roof soffit. 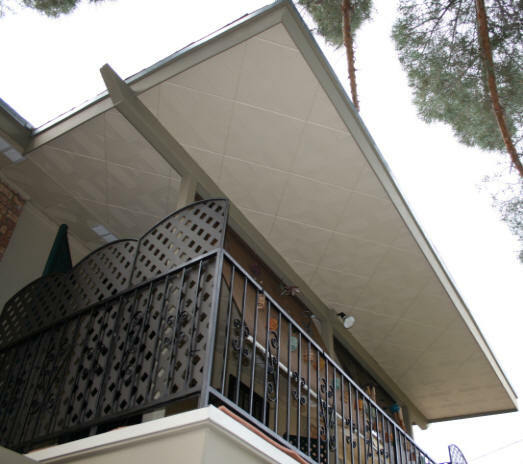 Some of the materials used for the ceilings and soffits were Hardie board (compressed cardboard) or plywood. For the seams, they were covered with a thin piece of moulding that over time, pops off. 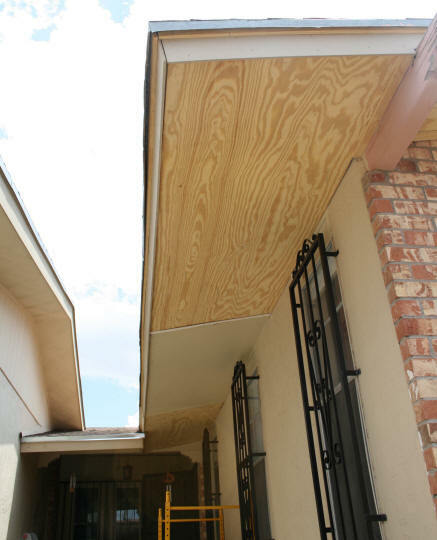 The areas with plywood replaced the Hardie board that had been damaged by rain. The hardest decision to make was the style of tile to use. 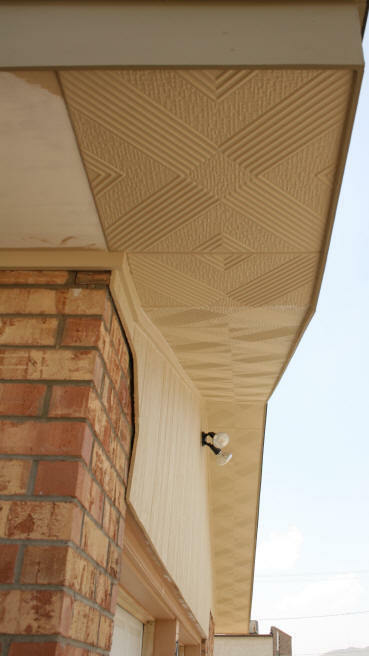 Since I would be installing this tile on my roof soffit, which has various widths, I needed to select a pattern that could be trimmed a few inches and not "look" like it was chopped off. 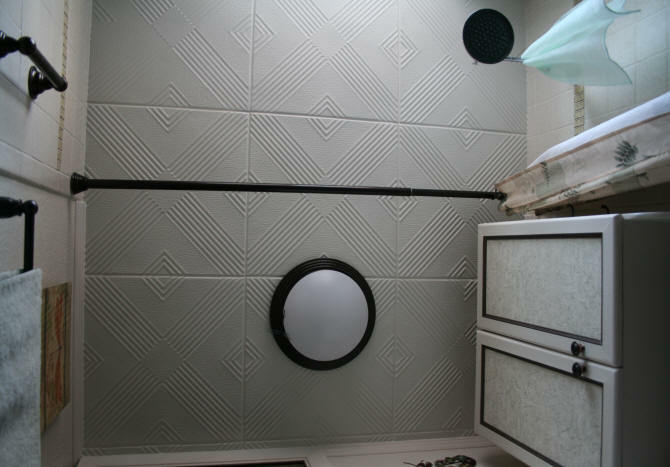 Fortunately the width of the soffits going around most of the house was close to the width of the tiles. So very little trimming, as you will see, was needed. The style of tile I chose is shown to the right. One company calls it Malta. I ordered from both companies mentioned above. Whoever had the cheaper price at the time. Since I had no idea how many tiles I would need for this entire project. I ordered 100 at a time. Yes, I could have measured everything to get an estimate but I decided to just order as I needed them. I had a lot of other work to do besides placing the tiles on. I set up a paint station in my garage and would paint about 20 tiles at a time over a period of several months. 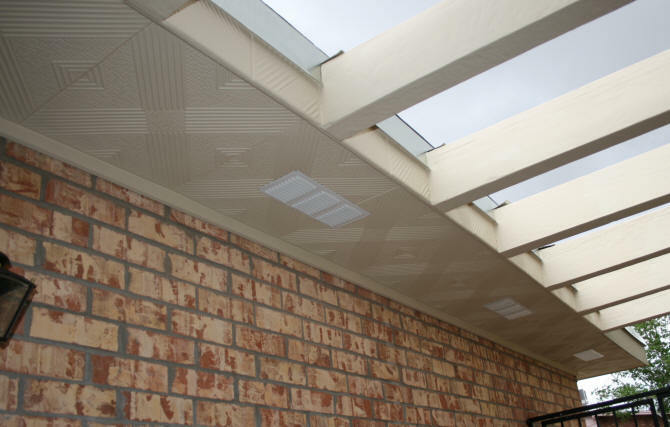 The first outdoor tile installation was done under the roof that covers the front patio. 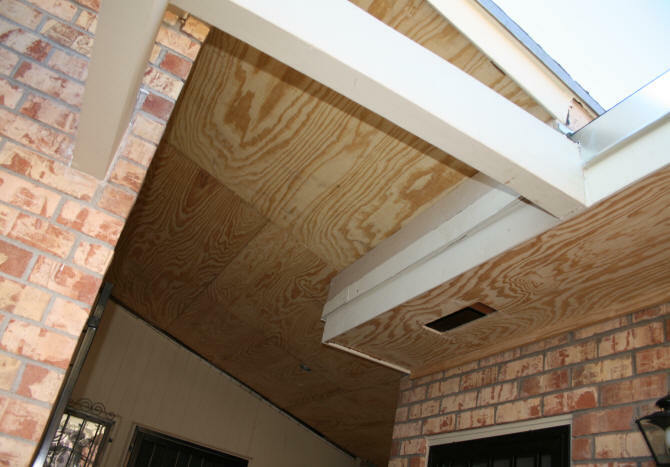 During the garage roof construction, the water damaged Hardie board ceiling was removed and replaced with plywood. During the construction I asked the workers NOT to put on the trim to cover the plywood seams. I knew the styrofoam tiles would cover the plywood seams. I could have just placed the tile on the bare wood. But I wanted a smoother surface so the tiles would stick on the surface better. So the plywood was primed with an oil based primer. 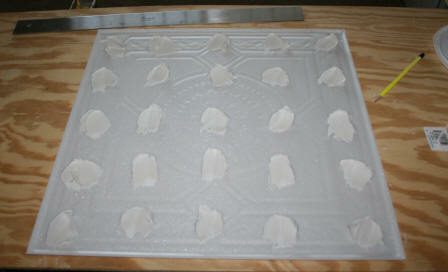 After waiting a couple days for the primer to dry, I placed the tiles on ceiling, starting in the center. The moulding along the top of the walls was left off. A hole was cut for the light fixture. Tiles being installed on ceiling outside front entrance on primed plywood. 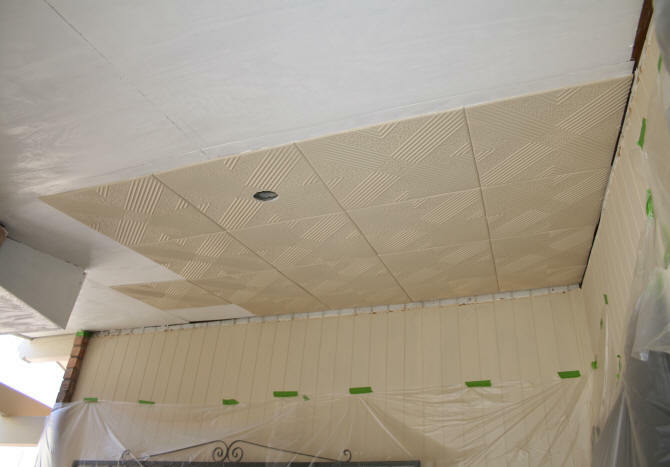 To have the adjoining soffit area match the ceiling, I continued the tile pattern down the side of the soffit and underneath. 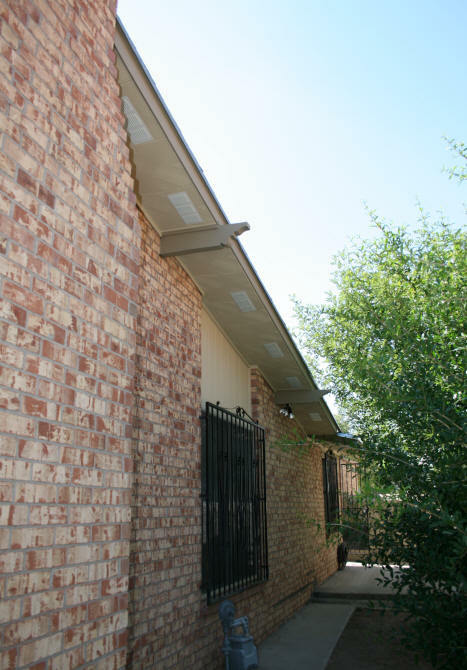 Besides the trim that was added at the top of the walls, I added trim along the edges of this soffit. The reason for this was to seal the tiles edges from water and to make it look better aesthetically. 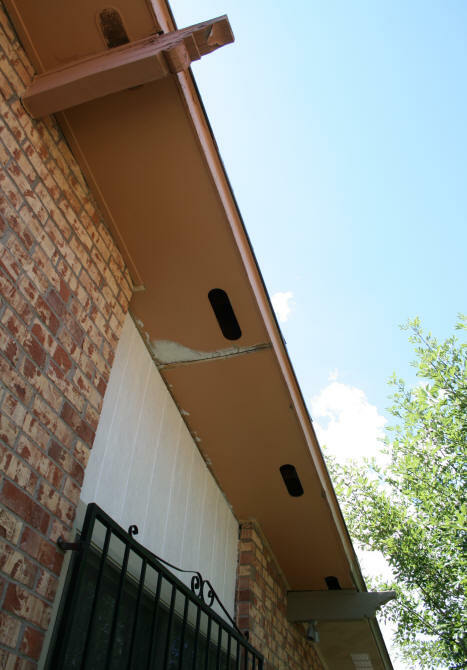 This vertical edge of the soffit does get hit with rain. After the front entrance area was completed, I shifted to the front of garage. I needed to finish placing tiles on the soffit on the front garage roof so I could finish up the soffit that led to the front entrance. Since all of the garage roof was new construction with fresh plywood, it all received a coat of oil based primer. When the paint had dried, I started placing the tiles on. The important part of this section of the installation was the corner piece. It had to be trimmed and centered so the pattern matched up to the tiles going in two different directions. So I started on the lower corner of the soffit where the front entrance soffit and the front garage soffit meet and worked my way up. When I got to the top of the roof, I left the center piece of wood trim on, and cut the tile where it met the trim piece of wood. I cut the first tile going back down the roof in the same place the other tile was so it would match. See photo below. With this particular pattern of tile, the pattern matches, even though it was trimmed. 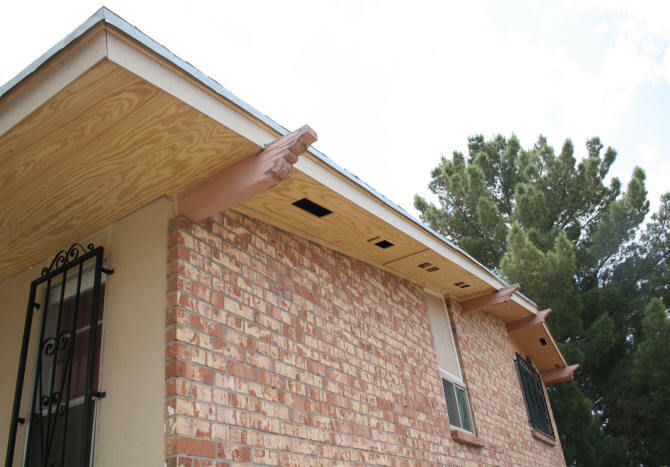 After completing the front of the garage, I was then able to complete the rest of the soffit from the front entrance along the east side of the garage roof. Because this was a shorter area, I did some measurements. I discovered that I would be able to fit almost 10 tiles in this area. It was about 1.5 inches too long. To cut one tile 1.5 inches shorter than all the others would have looked odd. So I spread the 1.5 inches over the 10 ten tiles. I trimmed off about 1/16" on each end (1/8" per tile) which did not cut into the design. Over the distance, it came out to 1.5" with a little bit of tweaking. Overall, it worked out. After caulking and painting and the installation of the soffit vent covers, you cannot even tell. With some scrap pieces of tile I also covered the fascia on this section between the wood beams. 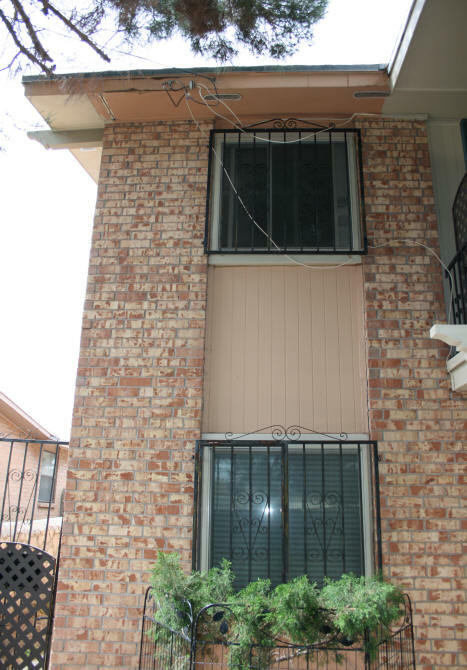 This was because the old fascia took a real beating during construction and looked awful. 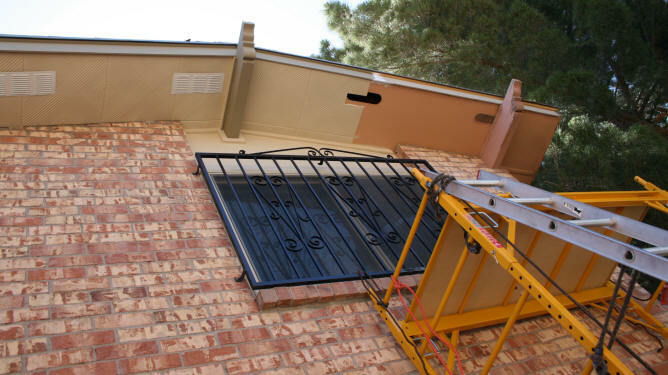 Now that the front entrance and two sides of the garage soffits were finished, I continued working on the soffits around the garage. 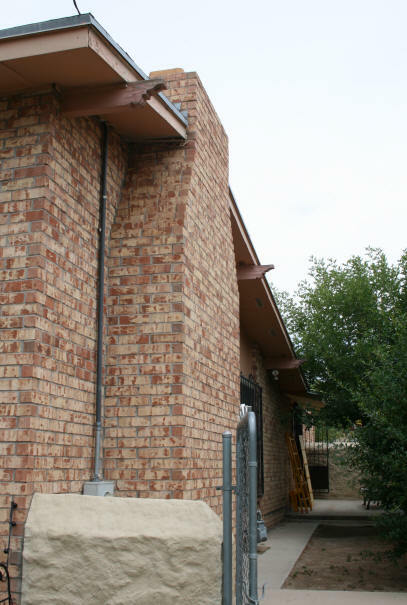 After I completed installing the styrofoam tiles on the garage roof soffit, I was back to the front entrance area where I had the roof extended to cover stairs that led to the stucco wall patio. 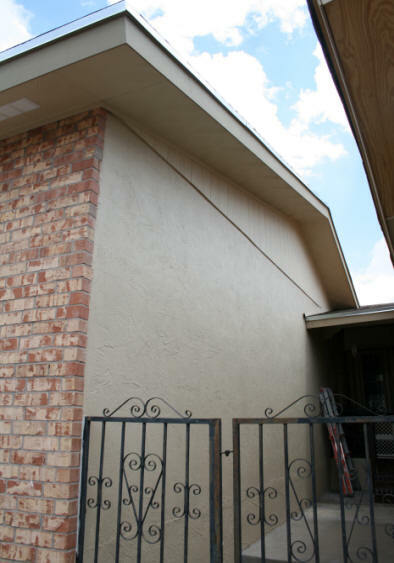 For the house roof soffit over the stucco patio and the west side of the house, I am dealing with old sheet rock (stucco patio) and old Hardie board (west roof) in addition to the newer plywood which replaced damaged areas. Because I was tight on funds, I only had the damaged areas repaired during construction. For the stucco patio I needed to make sure the area where the plywood met the piece of sheetrock was level in preparation for the ceiling tiles. There were some damaged areas on the sheetrock that needed to be filled in. 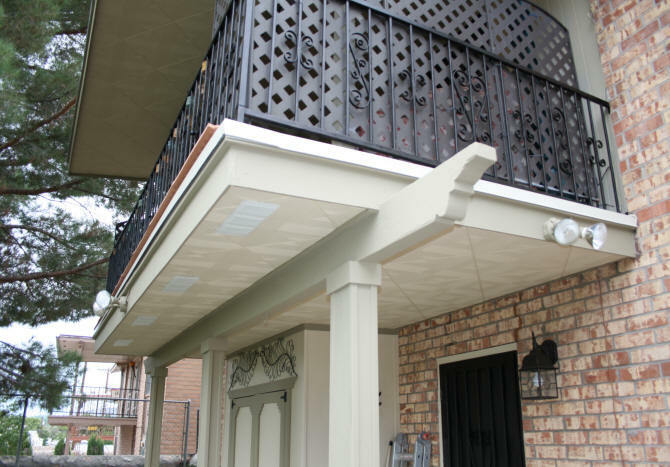 The stucco patio soffit is about 36" wide. So I centered the ceiling tiles and made cuts on the inside and outside pieces working from the front entrance to the corner. 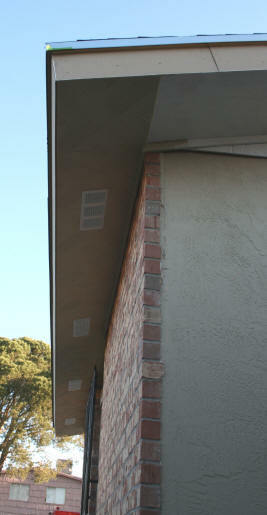 The next section of the house was the east side roof soffit. Most of this section was not touched during construction. As I did repairs along the roof, I added the tiles. The one section of the east roof that had new wood was the soffit over the kitchen window. 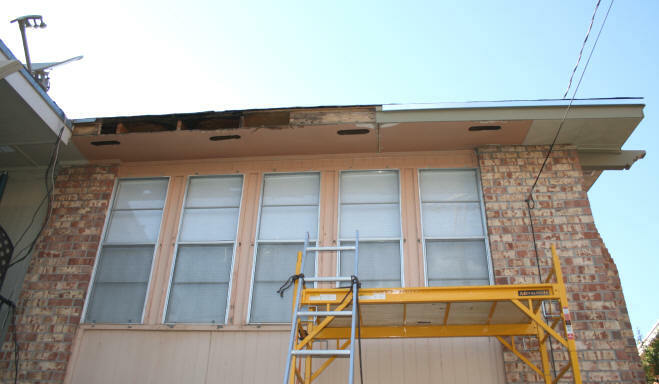 The entire soffit was ripped out and replaced. 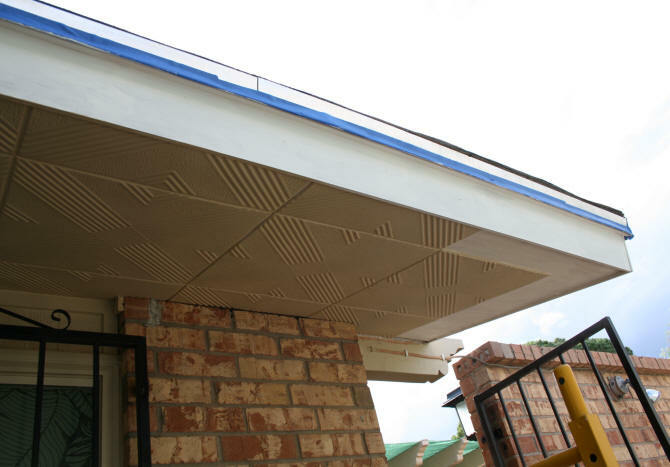 This wider section of the soffit was measured to find the center and the tiles were placed on after the new plywood and fascia were primed. 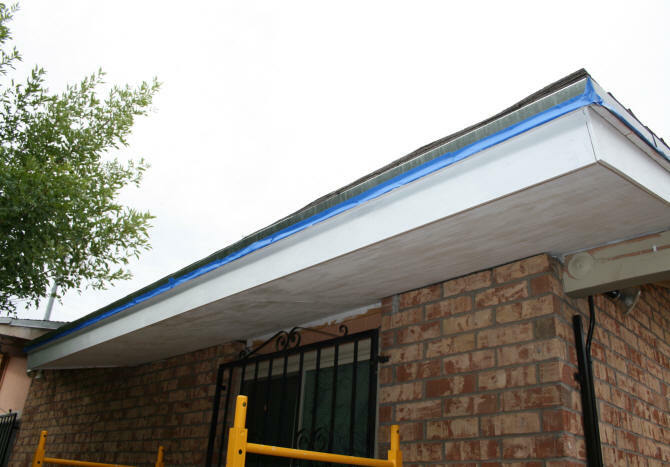 After caulking and painting this section, I continued up the soffit of the east roof. Soffit above window area complete except for corner where electrical wire is. Still need to add moulding against brick. Besides the ceiling tiles, I was also stripping paint off the wood beams, covering old siding with new siding, and sanding wrought iron along the way. 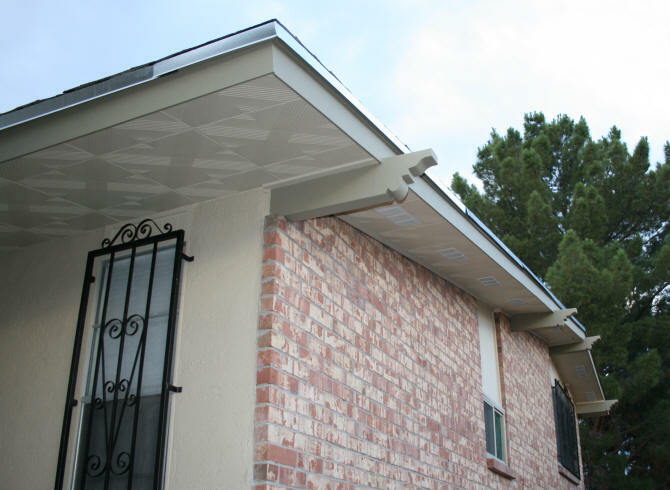 If you are only installing the ceiling tiles on your soffits it should be very quick. 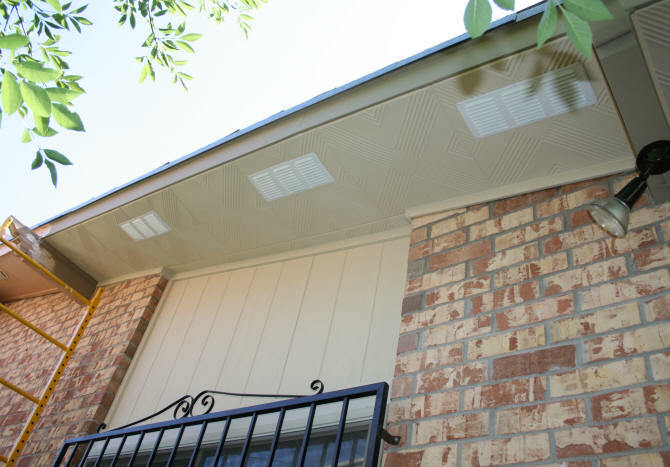 You can see the dramatic difference in a section of this roof in pictures below. Of note on the soffit vents...the former covers for the vents were these round plastic covers that you pop in over the hole. The problems with the plastic covers are that they get brittle after a few years, break apart, and fall out. 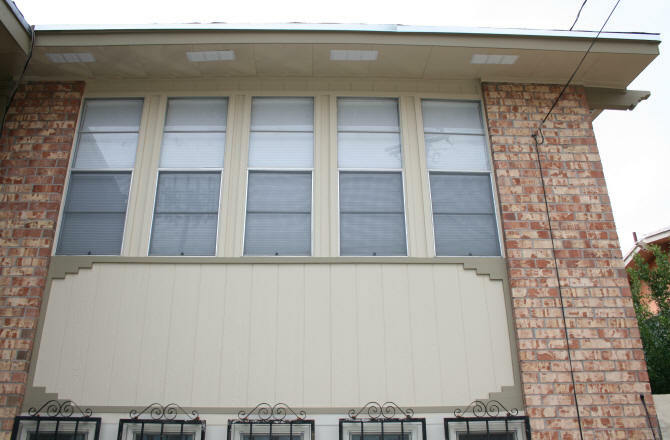 To reach most of these vents on the high sections of the roof is dangerous with a ladder. So I bought aluminum vent covers that can be nailed or screwed in. I nailed them. Now I will not have to worry about the covers falling out like before. 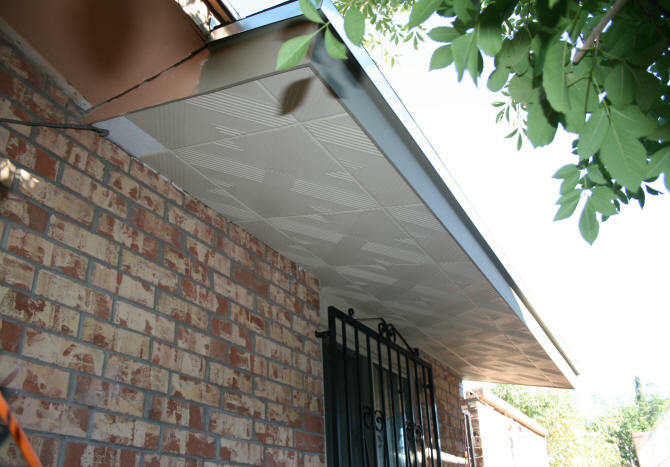 If you are doing any repairs around your roof soffits, like I did, it is highly recommended that you do all the other work first and only install your ceiling tiles last to avoid damaging them. I needed to remove old caulk, sand the old fascia down, remove old moulding, strip the old paint off the wood beams and sand them, install new siding above windows, etc. All actions that might have accidentally damaged the tiles. After the east side of the house soffits were complete, I moved on to the back of the house. The roof edges here at some extensive damage that needed to be repaired. Old fascia board and the fascia was removed and replaced with new lumber. After watching the construction crew repair other areas of the roof, I knew what to do. I had my husband help me with the demolition in this area. 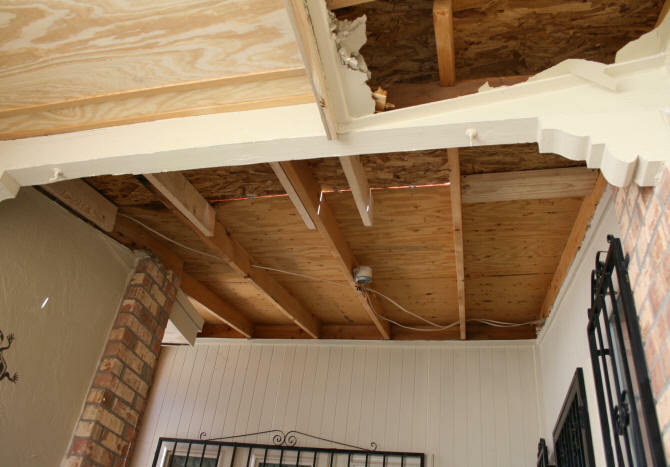 If you have damaged areas of your roof, you will need to repair it before you place any ceiling tiles on. Damaged area of roof on the back of the house being repaired. New fascia, fascia board, and flashing being installed. The back of the house has two ceilings besides the soffits. The balcony ceiling and the ceiling under the balcony. I will deal with those last. 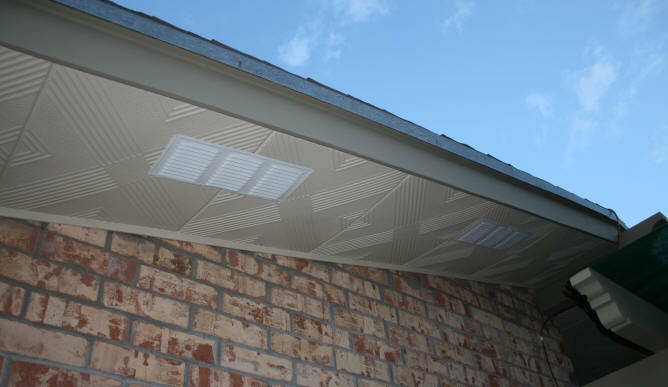 I had one more section of the back roof soffit. There were also a bunch of unruly cable wires that needed to be dealt with. After repairing the damaged fascia and building a box to hide the cable connector in, I installed the ceiling tiles. After installing the tiles, I ran the cable over the top of the tiles to the side of the house and painted the cables the same color as the tiles to camouflage them. Cable box mounted on fascia. Cables painted to camouflage them. Ceiling tiles were placed on the ceiling of the balcony next. For the ceilings in the back yard I laid the tiles out differently. I did each side of the wood beam separately. I first found the center and then worked out from the center. 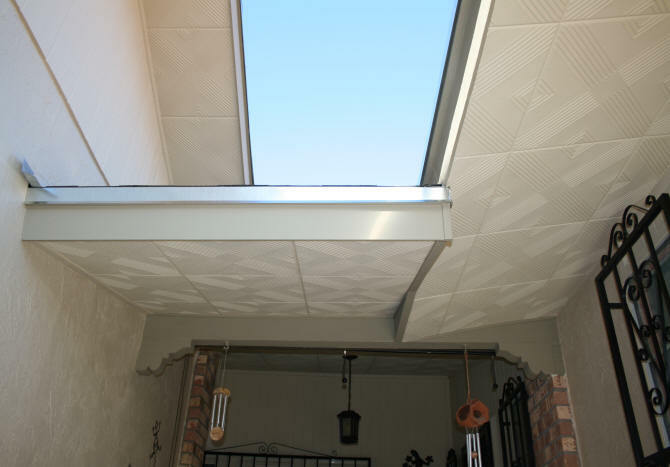 Now every outdoor area of this house has ceiling tiles covering the ceiling or soffit. How has it stood up to the weather so far as of November 2015? After a few hard rains, two days with nickel sized hail, and wind with gusts up to about 60mph, no damage. The tiles are, after all, on the underside of the roof. How many tiles did I end up using for the entire house? About 370. This includes tiles where I messed up. I have about 30 left over. Each tile was hand painted twice. Total cost, around $1000. Yes, this was very labor intensive. But I now have soffits like no other house. If I have any problems with these tiles, I will let you know on this web page. If you come across this web page several years later and I have not put anything else here, you can assume the tiles are doing just fine outdoors. 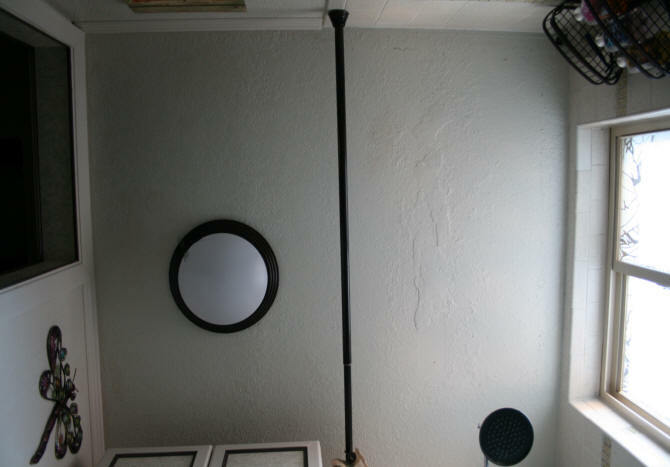 There is a ceiling area above the Main Bath bathtub that has been bothering me for years. Nothing was falling off, but you could tell where the ceiling had been patched before we had moved in. I should have had it re-textured when the outer part of this bathroom was renovated in 2013. This is a small area that only measures 61" x 58". I only needed 9 full tiles plus 1" edges on the 61" side if I do the measurements from the center out. I had some leftover tiles from outside tile project. I pre-painted the tiles the white color used on the walls. The only thing I removed was the light fixture. As of Spring 2018 this house will be on the market. The decision to sell this house, after all of the hard work and personal touches, was not an easy one. 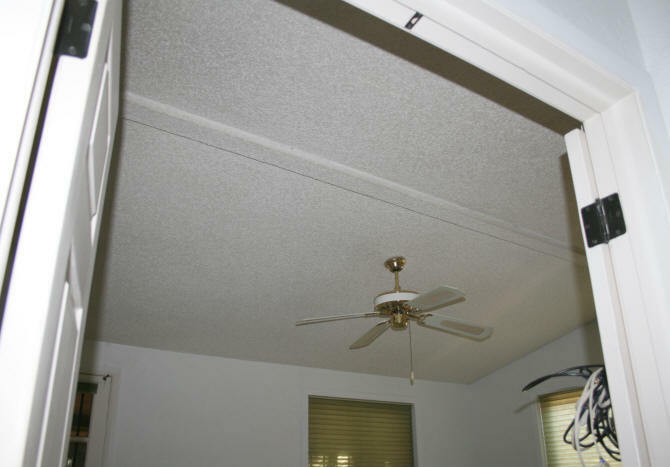 While I was in the months long process of preparing this house for sale, I decided to cover the popcorn ceiling in the Master Bedroom. My rationale for this, was the high probability that the future owner of this home would most likely be sleeping in this room. After almost 20 years of laying on my bed looking at this ugly ceiling, the ceiling tiles would be a nice touch and increase the appeal of the room. 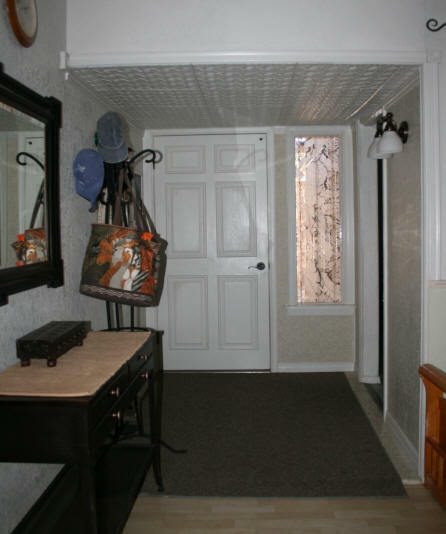 The ceiling in this bedroom is vaulted, which means the popcorn had also collected dust. It was gross. New carpeting for the house was already ordered. The scraping and cleaning of the ceiling in preparation for the ceiling tiles had to be done before any new carpeting was installed, because of the amount of dust. This room of the house is also the hottest during the summer months. The afternoon sun hits the roof of this room heating it up. The extra insulation that the styrofoam will provide will lower the temperature a couple of degrees. The styrofoam will also protect the sheetrock ceiling from the moist blast of the swamp cooler. In the middle of the vaulted ceiling is a beam. I suspect that this beam had probably been covered by the faux wood beams that exist in the living room, dining room, and downstairs recreation room of this house. If it had been there, it was removed before we moved-in in 1998. I thought about placing a faux wood beam up matching the other beams in the home. However, I would need someone to help me do this. I was doing this work without a helping hand, so I ruled out this option. Also, I was a little afraid of doing a whole lot of hammering or screwing on this ceiling and beam because it is 40 year old sheetrock, which might crack. At this point I am trying to get rid of as much stuff I have for the move, which includes any moulding I had bought and not used for years. 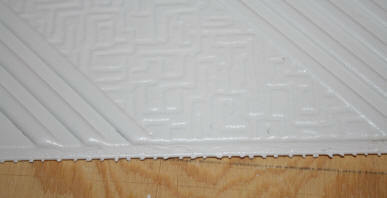 What I had on-hand were 6 pieces of pvc lattice moulding, that I ended up not using for another project. I discovered that the moulding was just the right size to fit on the vertical sides of the beam without any cutting. The lattice moulding also went up easily with just finishing nails which went in without causing too much stress on the beam.. At this point, I still had no idea what to cover the underside of the beam. Before placing the pvc lattice on the beam, I carefully measured the room and laid out the tiles in my computer graphics program. I needed to know exactly how many tiles I would need. I needed 76 tiles so I ordered 80....just in case I messed up. 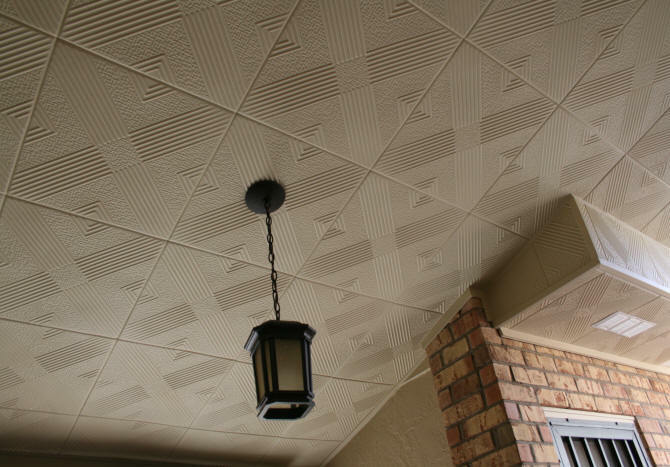 I decided on a more traditional design and chose the Lima pattern from Antique Ceiling Tiles. They were on sale at the time. Cost for 80 tiles including shipping was $216. I already had some mastic and white caulk on-hand. 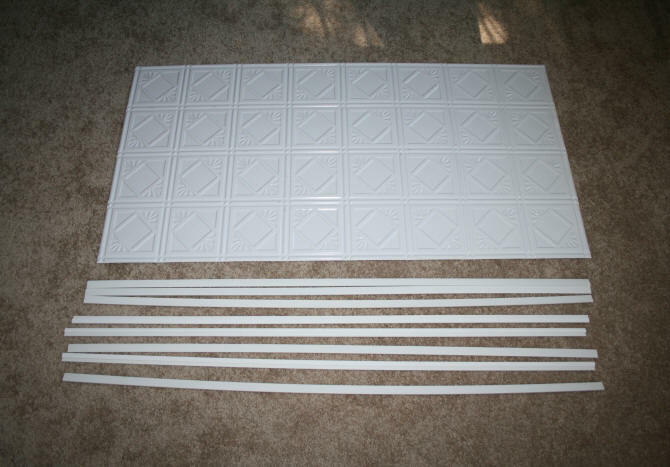 The tiles are white and will not be painted. When the tiles arrived, I found the center of the room and started laying the tiles. 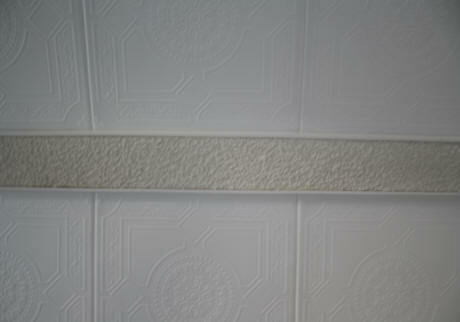 Amount of mastic used on each tile Because of the beam, I needed to treat the room as two ceilings. I wanted whole tiles at the beam. The partial tiles will be at the walls. Working from the center I worked on the bathroom side of the ceiling first. After finishing the bathroom side of the ceiling, I worked on the other side of the beam. Polystyrene chair moulding (I wanted something thin but a little decorative) was placed against on the top of the wall and the ceiling tiles to give it a more finished look. The tile seams were sealed with white caulk. Because I was not planning to paint the tiles, extra care was given to make sure any excess caulk or mastic was cleaned from the tiles because it would show up. It took me a week to get up the tiles and the moulding around the room. 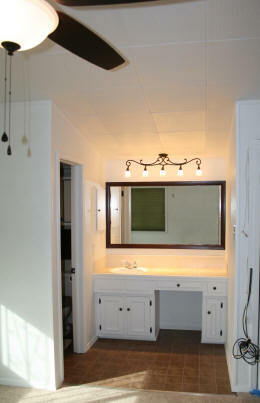 After the tiles were installed, I added a new fan and light fixture to the bathroom sink area. I still had not found a solution to cover the underside of the ceiling beam. The material had to be lightweight. 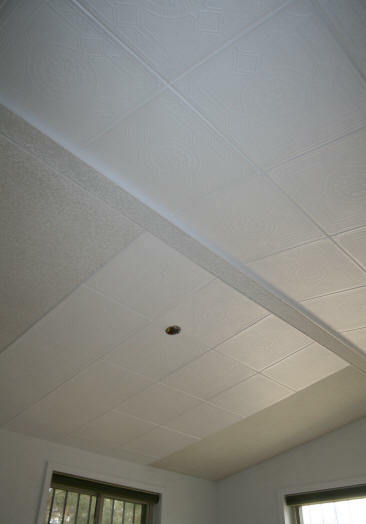 I thought about using the ceiling tiles I used for the ceiling but cutting a 5.25" width section would look awkward. The same company had polystyrene wood look planks, which would have worked, but they had a minimum order requirement for these. I only needed a few planks to cover the 14 feet of beam. I could find nothing at the hardware store......AND I walked through all of the isles. The idea I came up with, came to me in the middle of the night. Hey..... what about the material I used for my kitchen backsplash? They had tile patterns that might fit my 5.25" width requirement. I went online to the DIY Decor Store website to see what patterns they had. Besides backsplash materials, they also have ceiling products. 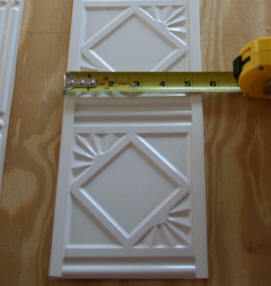 I ended up buying one of the 2 x 4 feet white traditional tile pattern ceiling panels and 8 of the J-trim pieces. The ceiling panel would be cut in four long sections. The J-trim would be used to hold the panel to the beam and cover the edge. I re-measured the underside of the beam to see what variations I had in the width. It ranged from 5.25" to about 5 3/8". With the J-trim attached, each strip that I cut, had to be 5 3/8". 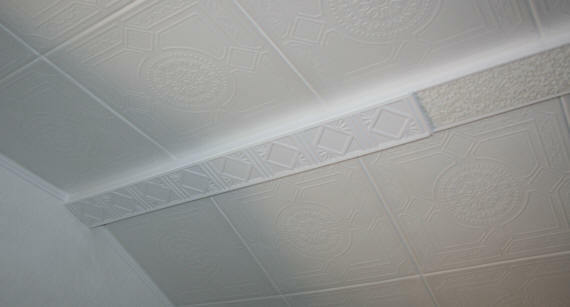 The ceiling panels are made of thin plastic, so cutting them was easy with regular scissors. 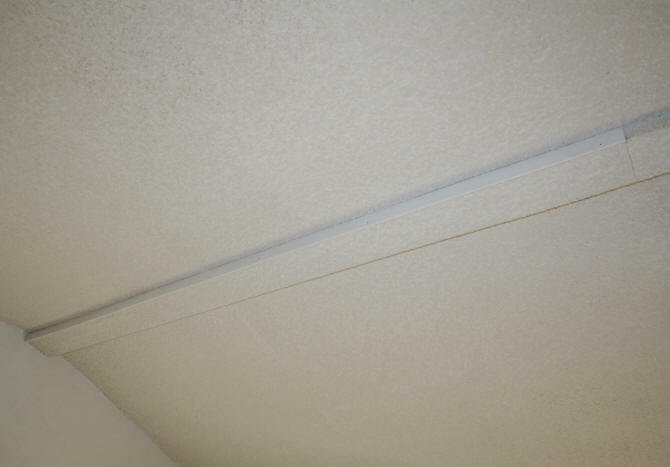 With the J-trim attached to the cut ceiling panel strip, the strip measure 5 3/8". I planned to glue only the J-trim to the edge of the pvc strip on the beam. Which means the panel strip would be able to slide a little if needed. To glue the j-trim, because it was light, I just used caulk. 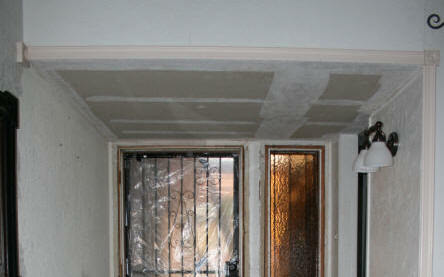 The caulk was placed on the ceiling and the J-trim. I let the caulk set a little for about 20 minutes and then placed the strip on the beam. I continued along the beam until it was covered. I had a strip a little under 2 feet left over.